In its capacity to fill one’s heart with horror and wonder, it is clearly the most staggering prophetic image one can find in the entire Holy Bible. It is recorded in the seventeenth chapter of the book of Revelation—John’s description of the Whore of Babylon. If there ever was a conspiracy against nations and people of earth this is its highest ensign. 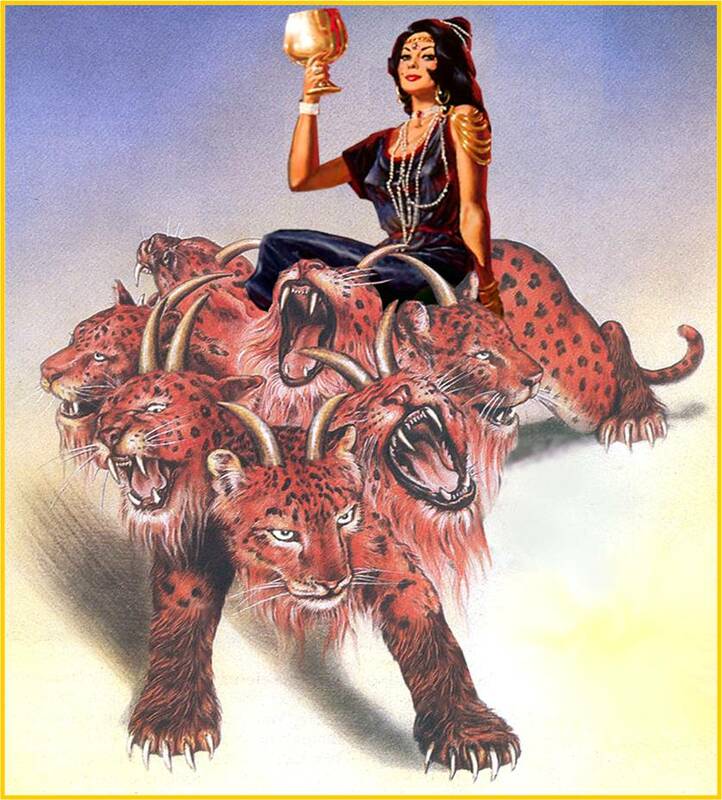 The Mother of Harlots, sitting upon a beast, is wealthy beyond compare—she is “decked with gold and precious stones and pearls,” and she holds a “golden cup in her hand full of abominations and filth of her fornication.” The mysterious woman, regally arrayed in purple and scarlet color, is drunk, but not from alcohol and strong drink; the Mother of Harlots is drunken “with the blood of the saints and the blood of the martyrs of Jesus.” No black widow could compare with this sinister and evil woman. This is no lady. This is a stone-cold serial killer who feasts on the blood of the saints of Jesus and no doubt leaves the world littered with the remains of destroyed souls. More than that, the sinful Mother of Harlots sits upon the beast that came up out of the bottomless pit (hell) and will in due time “go into perdition.” Yes, the Great Harlot exercises all the ominous and savage power of the horrific beast, the Behemoth, which shall bring such utter misery to every man, woman, and child on this planet. • Who is the beast that she sits upon? • What is their terrible plan that is even now quickly coming to pass and that will bring such blood and horror into all our lives? Is This the Pope and the Catholic Church? As a young man, I listened to many preachers and Bible prophecy teachers who warned that Mystery Babylon is none other than the Pope and the Roman Catholic Church. From the days of Martin Luther, whose heroism and devotion inspired the Protestant movement and the Reformation, Christian leaders have pointed to Rome as the center of global wickedness in the last days. Many believed that the Pope is the very antichrist, the man of sin whose number is 666. However, in the span of just one generation—in my lifetime—the ecumenical movement and the tendency of the Christian establishment to grow jaded and lukewarm have significantly cooled the ardor of pastors and prophecy teachers. 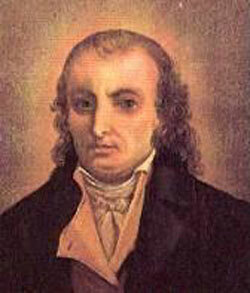 No longer do most criticize the false teachings and abominations of the Papacy. 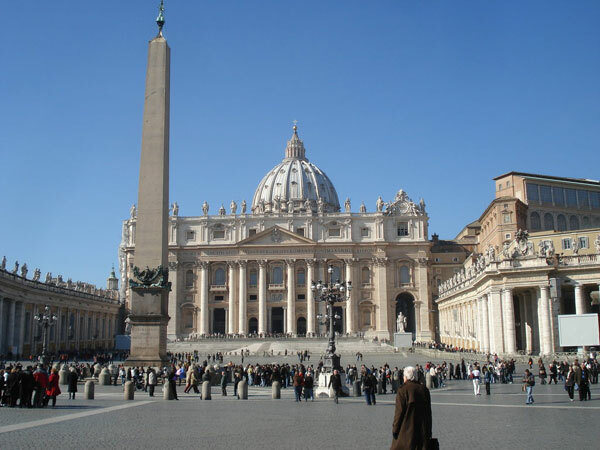 Instead, they have jumped into bed with the Pope and swallowed the toxins and poisons emanating from the fountain of St. Peter’s Basilica in the Vatican. But the “Falling Away” of the apostate Christian Church does not change the prophetic truths of the Holy Bible. The question still arises in the hearts of the faithful saints: Is the Vatican and the Papacy “MYSTERY, BABYLON THE GREAT?” Regardless of what our dulled clergy and compromised Church leaders suggest, what does God’s Word reveal to us? 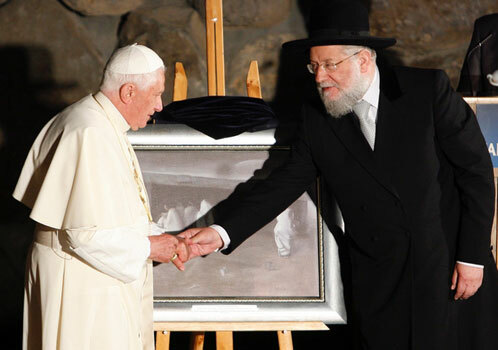 Pope Benedict XVI meets regularly with Jewish Rabbis and has ordered all Catholic priests to cooperate fully with their “elder Jewish brothers.” According to the Vatican, the New Testament is flawed, and the Jews have their own “eternal covenant” and do not need Jesus. The Pope is greeted by the Chief Rabbi of Rome before speaking to the assembled rabbis. The Pontiff reassured the Jews that the Catholic Church has changed and now endorses Judaism’s doctrines that Jesus did not come as Messiah and so the Old Covenant is still in effect. 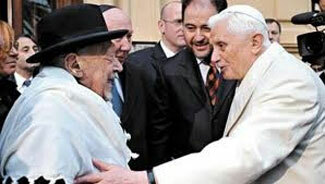 Pope Benedict XVI shares a secret Masonic handshake with Chief Rabbi Lau in Jerusalem. A rabbi lectures Pope John Paul II in Poland. 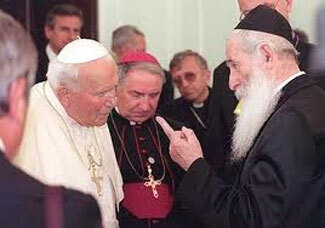 The frightened Pope took down a cross after the rabbi complained. What About the Synagogue of Satan? While questions must be answered about the Pope and his Romish Church, there has arisen yet another great competitor for the infamous title of MYSTERY, BABYLON THE GREAT. I refer, of course, to the Synagogue of Satan (Revelation 2:9 and 3:9). In our generation, the monolithic power of World Jewry has galloped to the forefront. With its vaults of banks bulging with stolen cash, its balance sheet hefty with plundered wealth, its Israeli nation aided and abetted by the military muscle and diplomatic might of the world’s greatest superpower, the Jewish-ruled United States of America, the Synagogue of Satan today sits at the pinnacle of earthly dominion. The Zionist elite have a heinous Plan that is now being worked to usher in the Jewish Utopia. Their Messiah, the Antichrist, will be at its helm. And once this Plan is realized, Gentiles everywhere will tremble with fear and trepidation. Make no mistake about that. So, which satanic cult will turn out to be MYSTERY, BABYLON THE GREAT? Will it be Rome, or will it be the Jerusalem/Washington, DC axis that makes war on the saints and spills their blood and places all of humankind into the iron jaws of a global, Big Brother Police State? What does the Bible say? I am pleased in this newsletter and on our powerofprophecy.com website to offer you an eye-opening new book just released. I believe this book will answer many of your questions on this vital, prophetic issue. Frankly, there has never been a book exactly like this, authored by a born again Christian of such sterling credentials. The title of the book: Solving the Mystery of Babylon the Great. It was my privilege to author the Foreword. The author is Edward Hendrie. Now I have had a number of fascinating private discussions with Mr. Hendrie, and I have discerned the genuine heart this godly researcher has for Bible truth. His new book is large format and almost 400 pages. What he reveals in these pages is a great discovery that God also put in my heart some years ago. Its stunning conclusion will, I promise you, unshackle your senses and enlighten you in a most important way. Hendrie presents a mountain of evidence, buttressed by factual documentation, proving that MYSTERY, BABYLON THE GREAT is both of Zionism and of Rome. Could this be? Could the Vatican and its Supreme Pontiff be the world’s greatest and most stultifying evil hoax? 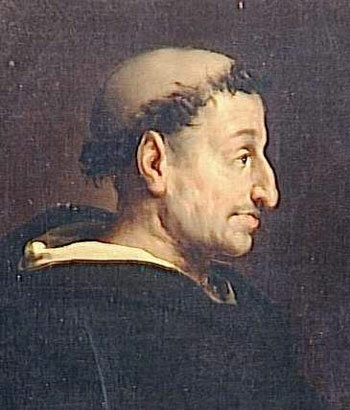 Are the sinister leaders of the serpentine Synagogue of Satan the actual hidden masters who pull the strings of the Papacy? In these momentous days in which Satan is preparing America and the world for the final, gargantuan assault on our liberties, our freedoms, and our very souls, are the Zionist Illuminati elite and the black and scarlet-robed men of Rome conspiring together for our demise? 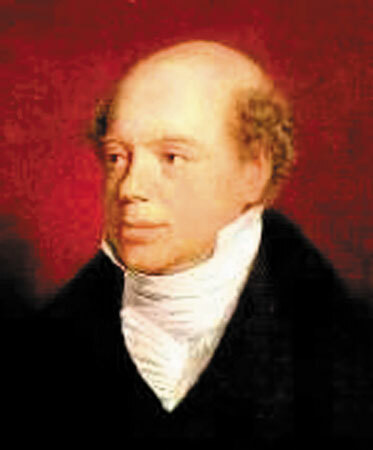 According to the Jewish Encyclopedia, Lord Nathan Mayer Rothschild became “Guardian of the Papal Treasures” and the Vatican banker in 1823. Thus, the terrible power of money and religion were finally brought together. Torquemada (left), a "converted" Jew, was commissioned by the Pope and tortured and killed untold thousands during the Spanish Inquisition. A Jew, Adam Weishaupt (right), founded the bloody Order of the Illuminati in Bavaria in 1776.
Who is Edward Hendrie and what qualifies him to write this amazing book? Hendrie is a successful attorney, a constitutional expert. He is author of three other books. To those who may accuse him of being a Catholic basher, let me add that Hendrie is himself an ex-Catholic. Raised in the Catholic faith by devout Catholic parents, he exclusively attended Catholic schools and graduated from America’s most prestigious Roman Catholic University—The University of Notre Dame. He subsequently earned his law degree from a Jesuit institution—the University of Detroit, in Michigan. Imagine: A book like this unmasking Rome, the Jesuits, and the Papacy in a spectacular way, written not by a Protestant with an axe to grind, but by a brilliant man whose entire life was once wrapped around the false claims of Rome and the Jesuit Order—until, the day he met Jesus. 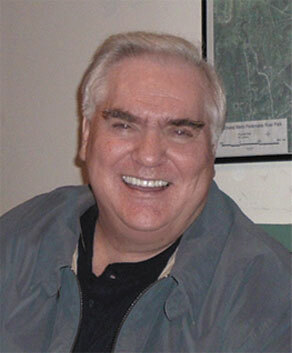 I am privileged to be interviewing Mr. Hendrie on my Power of Prophecy radio program this month (Dates of Broadcast: 2nd and 3rd weekends of March) for two, power-packed hours. You will be thrilled to hear his testimony. The CDs and/or Audiotapes of these two broadcasts will be available in my April newsletter. Edward Hendrie has been given an awe-inspiring picture into the prophesied future world that awaits us all, and I encourage you to order this outstanding book today. I guarantee you will not be disappointed.